The Peacock returned here from a cruise, and the seamen, having received some prize-money, purchased several watches, and in a drunken frolic, they determined to fry the woks on the fire, and were highly entertained to hear such a number of them ticking in the frying-pan. When I first read these words, I took them to be a singular, drunken extravagance not to be repeated. It's such a bizarre and silly thing to do that it was something I took note of, but did not expect to be something I'd find anywhere else. Turns out I was wrong. 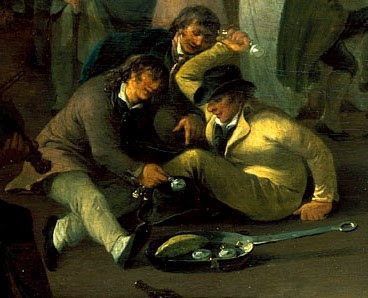 Though it is likely that the above work of art (also featured in Spreading Canvas: Eighteenth-Century British Marine Painting) is later than my period of study, it clearly shows sailors doing precisely what Kelly described in 1782. This drawing was probably a study for the later painting now in the collection of the National Maritime Museum. There is no fire beneath the pan, and they do not appear to be in a rush to light one. Perhaps this was a ceremonial celebration of prize money, a ritualized 'frying' of the watches. Lloyds Evening Post and British Chronicle, January 24-26, 1763, page 2. Afterwards these two jolly Tars met with one of their Mess-mates at a publick-house, the Landlord of which not having any thing they liked for dinner, one of them ordered in a frying-pan and a large lump of butter, declaring he would stand Cook, when they came to a resolution, nem. con. to fry their watches. This story was widely reported in newspapers on both sides of the Atlantic, which must have spread the frying of watches as an image of the carefree sailor flush with cash. In Carlisle Bay they [his shipmates] broke up and fried two or three hundred watches in frying-pans that they bought in Bridge Town and a good many of them are [eating] bank-notes between soft tack. Several other nineteenth century sources mention sailors frying watches and eating bank-note sandwiches, some American and some British. I have seen no reference to eating bank notes in the eighteenth century. Whether frying watches was still in actual practice in the nineteenth century is beyond me, but it does prove that the idea of sailors frying watches was still in the Anglo-American mind. 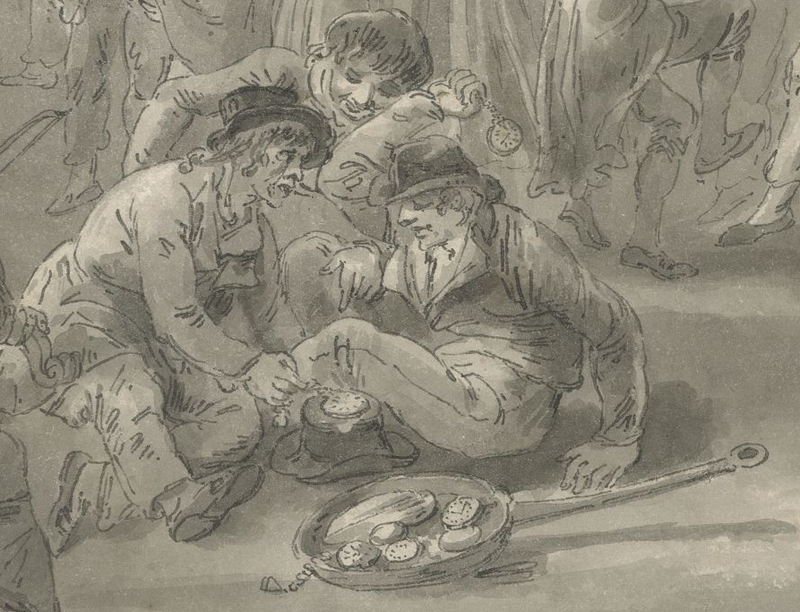 Perhaps the seamen of the Active inspired sailors over the next century to demonstrate their prize money through either a real or ceremonial frying. Kelly, Samuel, Samuel Kelly: An Eighteenth Century Seaman, Whose Days Have Been Few and Evil, edited by Crosbie Garstin, Frederick A. Stokes Company, 1925, page 54. Pindar, Peter, Celebration: Or, the Academic Procession to St. James's; an Ode, London: John Walker, 1794, page 6, via Google Books, accessed January 4, 2018. 'A Tale of a Tar' in The Rover, edited by Lawrence Labree and Arthur Morrell, volume 4, New York: S.B. Dean & Co., 1845, page 294, via Google Books, accessed January 4, 2018.